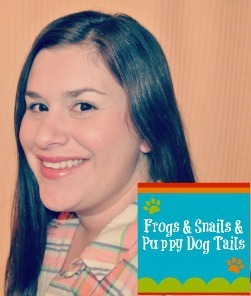 We are so excited to have Jaime from Frogs and Snails and Puppy Dog Tails here to guest post for us! You can fine Jaime on Facebook, Google+, Pinterest, and Twitter. Stop by and follow along so you don't miss a post from her! I have seen many suncatchers on the web and I always say we need to make one of those. The suncatchers always look so pretty in the window. I figured they had to be fun to make also. Well what better time than today to try making one. I think I was more excited to start than the kids because they didn't really know what we were going to do. Even the most classic of activities to a young kids is brand new. I love seeing them get excited about a "new to us" project. I hope you all can get excited too, even if you have made one before. I took a piece of contact paper and folded it in half. Then I took a plastic plate and traced it with a marker. I then cut almost the whole circle out. I took this and taped half down to a tray. I peeled up the paper to leave the sticky side up for us to add glitter and the buttons. Once we had everything on it we wanted, I took the top half of the contact paper and peeled that paper back and folded it over the bottom half. Now both pieces folded over each other holding in the buttons and glue. I then took a hole punch and made a hole at the top. I took ribbon I had cut and pulled it through the hole. I used a glue gun and glued the ribbon over itself to use to hang the suncatchers up. This was our first time making a suncatcher. The boys really enjoyed it and so did I. Big brother used buttons and dry glitter. Little Brother used glitter glue and buttons. I may should have let the glitter glue dry before closing up. I am always learning something new. Even tough we didn't let it dry I think they still turned out great. The kids had fun and are happy to look at them on the window. Now if we could only get a little sunshine over here,lol. 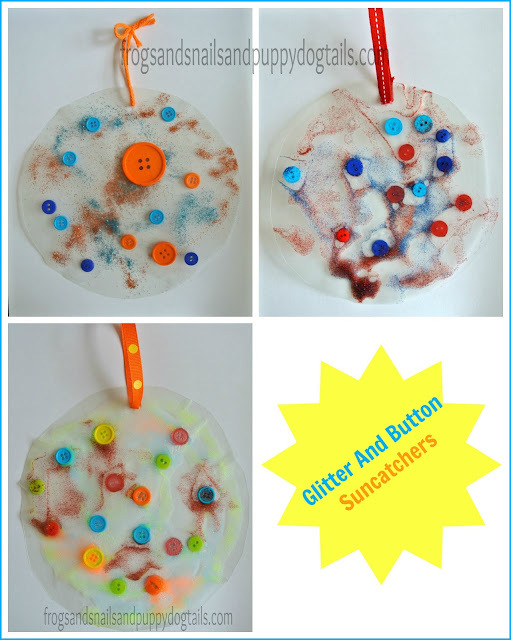 Making these suncathers was a great rainy day activity for us. We look forward to making more in new ways in the future. playing. Please keep this in mind with any post you read of mine!